Until now. 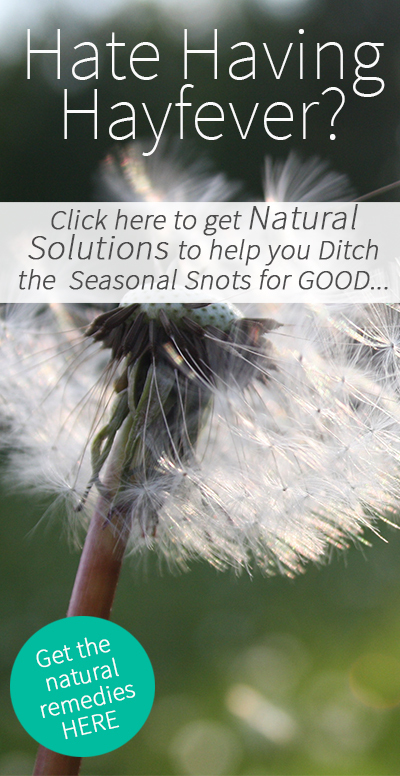 This year I felt I should take one large leap of faith into the world of natural healing and health and go drug-free and combat hayfever as naturally as possible. This was a scary step to take since, in my past experience, not using antihistamines means I have itchy eyes, a runny nose, gunked up eyes, broken skin around the eyes and generally feeling ill. It hasn’t always been an easy journey as I have had to learn to listen to what my body needs and trying out new herbs dosing and trying out new alternatives, but thankfully it has paid off. Being super naturally healthy is possible. So I will not share with you all the failed teas and herbs I’ve tried (of which there has been many) but I will save you the hassle and give the good stuff. Combating Hayfever Naturally (and other allergies too). 1. Drink Raw Apple Cider Vinegar. Sounds weird and a bit gross, but it is actually totally fine to drink. I have some warm water when I wake up with about 1-2 tsp of RACV (raw apple cider vinegar), then I mix it in with water and teas during the day. I notice the difference straight away. It is highly nutritious – it contains a whole host of vitamins and minerals (calcium, potassium, iron) and when you buy the raw stuff it also has probiotic properties! It is a decongestant – (so also great for colds and flu) as it helps break up mucus in chest and sinuses. It helps create a hostile environment for bad bacteria – (like those which cause body odour and candida/yeast infections) as it is a highly alkaline solution. It has antihistamine properties – prevents the histamine reaction in the body when its come into contact with pollen (or other allergins). Again, another bizarre suggestion but, again, this really works. I began by just buying nettle tea and drinking it (strong 2-4 tea bags per cup) throughout the day. Then I got sick of drinking so much tea and bought nettle root capsules which do the trick wonderfully. I take about 2-3 a day (morning, afternoon and sometimes evening depending on how I am doing) and this means I no longer have to carry tea bags everywhere I go! Nettles contain prostaglandins which have properties that support resistance to inflammation and they have a high antioxidant activity which means they fight microorganisms well and there have been recent studies to show it helps fight neuro-biological disorders well. I saw in the health shop a lovely balm to put on your nose and eyes to prevent pollen entering your body, the idea being that it will catch all allergens in its balmy goodness. It was pretty expensive (but smelled lovely) so my budget solution was to use vaseline instead. When I am about to cycle I dab it around my nose and a little bit on the inside of my eyes (discreetly people). Again I have found this helps, but is more of a preventative – it won’t help if you start getting symptoms. Ok, my tips are getting more and more wacky – I can you tell that I was/am a desperate woman in search of health? But boy turmeric really works, I was using all of the above and it was working fine, but not brilliantly, then I started taking a teaspoon of turmeric a day washed down with lots of water (lots and lots) and I am now trouble free. I notice my symptoms coming back on the days when I forget, so its now become regular habit. I just use straight organic stuff from the shop but you can get capsules which means you don’t have to endure the lovely experience of swallowing powdered turmeric (it’s not pleasant) but it will cost you probably ten times the price. I am on a tight budget, so to the powder it is. I recommend reducing your milk intake if you get very mucusy. Also think about reducing your overall grain intake, eat lots of vegetable, fresh broth, and salads. But mainly listen to your body – it will quietly be trying to tell you if there are any problem foods in your diet (things like constipation, diarrhea, bloating is usually the language it uses). Hayfever is your immune system flaring up and fighting the release of histamines in your body, so it needs all the support you can give it. I take about 1-2 grams (1000-2000mg) of Vitamin Ester C (more biologically available and easier for your body to absorb) a day during this season (and in general as I am focusing on healing my body and digestive system). This also gives you a tiny energy boost and help ward off colds and other nasties. Please note this is far above the recommended daily allowance but after researching the subject I have been convinced that mega dosing on some vitamins can be highly beneficial. The recommended daily allowances (RDAs) were decided a long time ago and new research and evidence are not taken into consideration. Also, our bodies are very clever and will start to tell you if you are taking too much (again, weird bowel movements will occur). If all else fails and you end up all itchy-eyed and groggy. Grab yourself some cucumber slices from the fridge, plonk them on your eyes, sip some RACV (diluted), grab some nettle tea and relax. 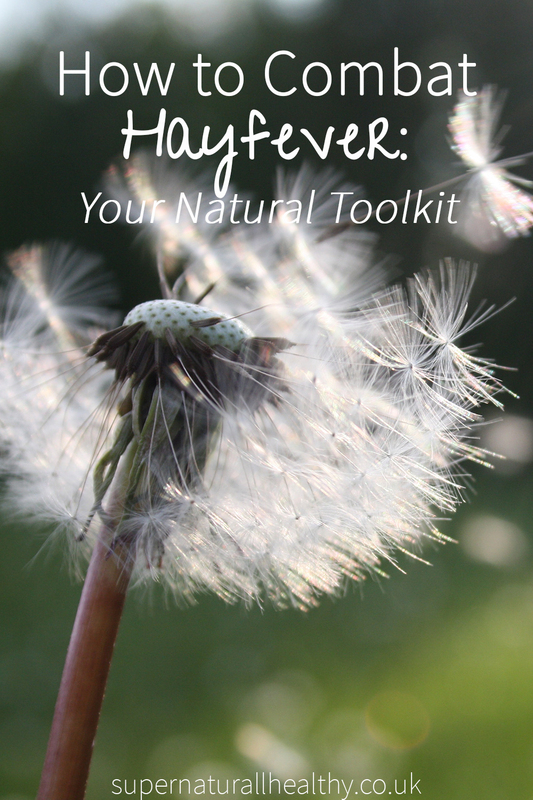 Does anyone else have natural tips for combating hayfever? I am always up for learning more! It’s funny actually – I’ve been chucking turmeric in everything lately, completely unaware it had anything to do with hayfever – isn’t the body clever at telling you what it needs!